Do you have a new baby on the way? Congratulations! Silvergum Photography’s “First Year Footsteps” portrait sessions provide the perfect opportunity to capture your baby’s precious first year. Your baby will achieve so many milestones over this time. 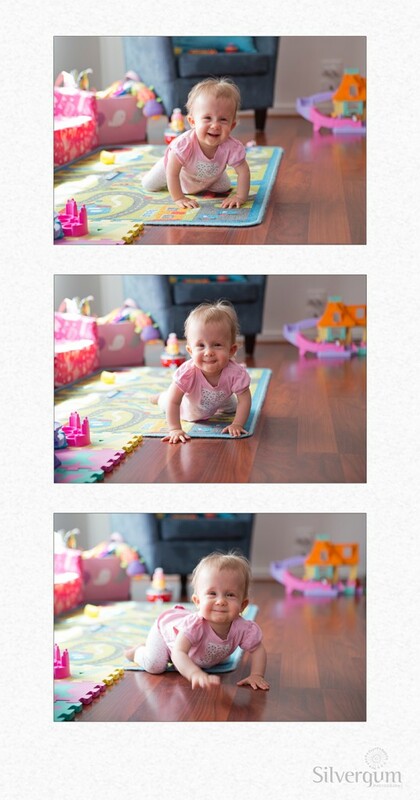 Their first smile, learning to rolling over, tummy time, sitting, pointing, discovering the world …. and of course their relationship with you will be quickly developing into a life long bond. A newborn session will capture your just how tiny you baby is, but that tininess won’t last for long and within in months you will have a smiling, wriggling and chattering little person in your home. This little person might barely resemble their newborn shoot, and that’s where the First Year Footsteps sessions come in. Sienna had only just started crawling not long before I arrived. What a privilege it was to capture such an achievement and this especially happy moment. How are First Year Footsteps sessions different to normal portrait sessions? First Year Footsteps portrait sessions provide the opportunity to have photographs taken throughout the year offering discounted pricing and customised finished artwork pieces. Simply book your first session (ideally before your baby is 2 months old). Anything ordered from this session will be at regular prices. Then book one or more sessions for your child until they turn 1 and receive 15% off everything ordered from these sessions. At the end of your baby’s first year you will have a beautiful collection of photographs and finished artwork pieces that will tell the story of your baby’s first 12 months. When is the best time for these portrait sessions? Spread throughout the year, your portrait sessions will be planned to ensure different stages of your baby’s development and their achievements are captured along with the things that are special to them at that time. These special items may include toys, blankets, some strange object they have discovered and love so much … babies can become attached to the strangest things! There is no specific timeframe for each session as each baby develops in their open time, however stages are within the first 2 weeks, when your baby can lie on their tummy and hold up their head, when your baby can sit and their first birthday. Are First Year Footsteps sessions just for babies? The First Year Footsteps sessions are only offered in your baby’s first year but I understand other family members might want to get in on the action too. And rightly so! As long as your sessions are booked with the primary aim of capturing your baby and their development, you are very welcome to include siblings, parents, grandparents and even pets in these portrait sessions. It’s a great opportunity to update your family photos to include your newest family member. Contact me by emailing steph@silvergumphotography.com.au and together we can start planning your First Year Footsteps sessions. Learn more about Silvergum Photography’s portraiture. This entry was posted in Babies and tagged children, First Year Footsteps, Silvergum Photography.